Here is Some Information about Naras Devi Temple in Bilaspur Himachal Pradesh India. Naras Devi temple is situated on a hilltop at Baroha, 2 km from Naras village that falls under the Bilaspur district of Himachal Pradesh. The temple is more than 400 years old and is believed to have been constructed by King Kalyan Chand, while establishing Sunhani as the capital of his kingdom. He is also said to have appointed a priest to bring 'Charnamrit' for the deity regularly. Naras Devi temple is dedicated to Goddess Durga, also known as Naras Maa. 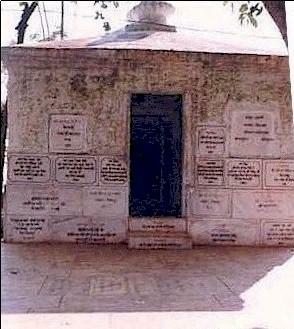 There are a number of legends attached to the temple and its formation. There are many legends regarding this temple. Priest who belongs to caste –Koli, tells that where now mata’s temple exist there was earlier a huge tree of Summann. It is said that once an asteroid type of light appear in the tree and later mata’s Pindi was found below the tree. Mata appeared in Pujari ancestors dream and ordered him to build a temple where the Pindi was lying so that people can worship Her. This Pindi is still lying in the temple. Another legend is that once Raja Kalyan Chand got angry over the Pujari, he asked to present Mata in physical form. Frightened Pujari’s prayed in the temple over night and requested Mata for protection from the king. When Raja Kalyan Chand reached temple in the morning he saw in place of Pindi embodied Durga Maa standing having her back towards Raja as she was angry and did not wanted to give Darshan. She presented her only to prove her existence. It is said that due to Mata’s fury, there was a war in between Kehloor and Saket in which Kehloor king died, that’s why Chandel Rajpoot’s do not visit Mata’s temple. By Road: A good network of roads connects Bilaspur with the rest of the country. The district is easily approachable by road from the cities of Shimla and Chandigarh. One can easily get taxis as well as buses to and from the major cities in and around Himachal Pradesh. By Rail: The nearest broad gauge railway station from Bilaspur will be the one at Kiratpur Sahib. Shimla, on the other hand, will form the nearest narrow gauge railway link.